When we write, we are faced with a set of rules that are different from the rules we use when we speak. Here is some information you should know! Make sure you include both a subject and a predicate in each clause. Roberta has written in her diary many times. 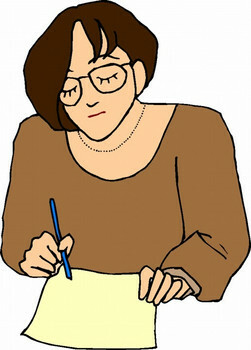 Roberta writing in her diary. Use complete clauses. Make sure that a single clause is not a dependent clause. Who is writing in her diary. When Roberta is writing in her diary. Add an independent clause to every dependent clause. Roberta always thinks before she writes. Punctuate phrases and clauses using the rule of adverbial movement: If an adverbial is moved from the predicate, it must be separated from the rest of the sentence by a comma. Before Roberta writes, she always thinks. Before Roberta writes she always thinks. Roberta is a writer who lives in Chicago. She can see the shore of Lake Michigan from her home. Use standard spelling rules. If in doubt about spelling, check a dictionary. Roberta carefully checks her spelling. Roberta carefuly checks her speling. Use standard verb tenses with the appropriate tense and person in the auxiliary and the appropriate form of the main verb. Roberta has written in her diary many times! Roberta has wrote in her diary many times! Use parts of speech correctly: verbs, nouns, adverbs, adjectives, pronouns, determiners, prepositions, intensifiers, and conjunctions all have their own functions. Roberta is concerned about writing correctly. Use paragraph format in writing. A paragraph has a topic sentence, several supporting sentences, and a concluding sentence. Roberta is a writer who lives in Chicago. She can see the shore of Lake Michigan from her home and likes to write about her life on the lake. Because she is concerned about writing correctly, before she writes, Roberta always plans her thoughts. After she writes, Roberta always carefully checks her spelling. She has written in her diary many times! Roberta is a writer lives in Chicago. She see the shore of Lake Michigan from her home. and like to write about her life on the lake. Because she is concerned about writing correctly. before she write.Roberta always plan her thoughts. After she write Roberta always carefully checks her spelling roberta has written in her diary many times!